New Technologies and Democracy Landscape -- Opportunities for Latin America. What’s going on with our democracies? Trust doesn’t disappear from society, it flows in a different direction. Politics is solving today’s problems with yesterday’s tools. The collapse of trust in formerly trusted institutions is a cultural shift that cannot be overstated. We need to design ways to manage this lack of trust in previously trusted intermediaries. Uruguay A new generation of digital political parties. Never before had it been possible to transfer value between distant peoples without relying on a trusted intermediary, such as a bank or government. Bitcoin began the separation of Money & State. Blockchain and cryptocurrency systems prioritize seizure-resistance, security, and immutability. If Bitcoin proves that a non-sovereign, peer-topeer, global store of value is possible, the geopolitical consequences for nation-states will be profound. Nation-States are losing the monopoly on giving us an identity. In this battle between the land and the cloud, there’s space for alternatives to emerge and do things that couldn’t be done until now. 15 percent of the world population, or 1.1 billion people, still lack an official ID. Do we have, for the first time in history, a technology that enables us to organize mass collaboration at scale without a central authority? , No voice? Then exit. 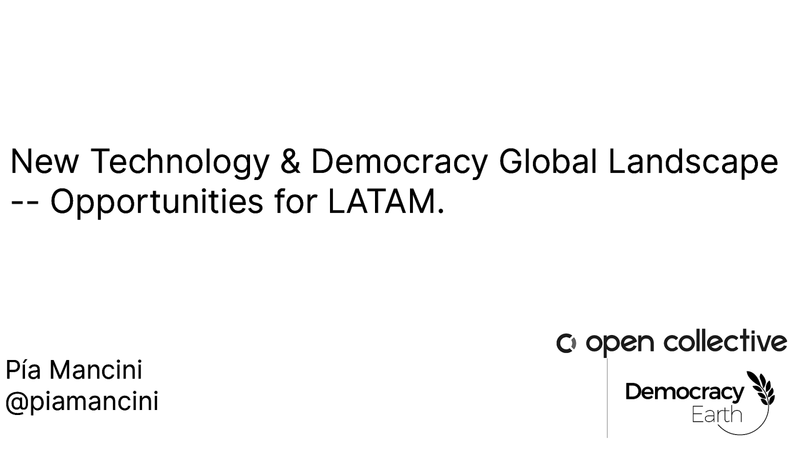 View New Technologies and Democracy Landscape -- Opportunities for Latin America. on Notist. Pia puts presentations on for free. You can too.